During the Ebola crisis my fellow Sierra Leoneans and I saw how conflicting messages and misperceptions about the disease contributed to its spread. I began working with IntraHealth International as a consultant in November 2015, right after the World Health Organization declared Sierra Leone Ebola-free. The consultancy was an opportunity for me to help improve the health system in my country. My assignment is to help the Ministry of Health and Sanitation implement two technologies. The first is iHRIS—open source software that helps countries track and manage their health workforce data, including mobile phone numbers. The second is mHero—a mobile phone-based communications system that connects ministry staff with frontline health workers via two-way SMS text messages. I am excited to support the ministry’s implementation of mHero and confident that it will strengthen health information systems in Sierra Leone. Like in Sierra Leone, the Ebola crisis severely weakened Liberia’s health sector and revealed system weaknesses, including a fragmented health information system. At the time of the outbreak, health officials found it difficult to obtain reliable information to make timely decisions. What’s more, many of the technologies that make up the larger health information system were not interconnected, meaning it was impossible to aggregate and compare data from multiple information systems easily . Implementing partners and other stakeholders had unintentionally contributed to this fragmentation by creating separate reporting systems for their projects or programs. In Liberia and Sierra Leone, when the Ebola outbreak hit, health officials had no way to reach frontline health workers with critical information in real time. These lessons prompted the Liberian Ministry of Health and Social Welfare to draft a Health Information System (HIS) and Information, Communication, and Technology (ICT) Strategic Plan last fall. All stakeholders and implementing partners must now align their efforts with the plan, complementing rather than competing with each other’s efforts. In December, I attended a workshop convened by the Liberian ministry to review the draft strategic plan and prioritize activities. In addition to representing IntraHealth at the meeting—since the ministry in Liberia is now using both iHRIS and mHero—I also hoped to learn more about how Liberia is rebuilding its health information systems so I could share their experiences back at home. Working with the other participants and seeing how everyone worked together was eye opening and exciting. By the end of the workshop, a cohesive draft plan was completed and next steps agreed upon for the coming months. After the meeting, I was fortunate to travel to Buchanan, a large city in the Grand Bassa county of Liberia with members from the mHero team, including Stephen Gbanyan, the Ministry’s Director of Health Management Information Systems and Hellen Greene, mHero Data Manager. Our mission was to raise awareness among human resource officers and health workers of mHero and show them how it works, so that they recognize mHero SMS when they receive them and are motivated to respond. We also talked to county-level human resource officers about future plans for mHero, which will enable them to create and send their own messages to health workers. The team in Liberia is doing a fantastic job making mHero an integral part of the health information system. During our trip to Buchanan, the human resource officer in Grand Bassa told us he was very enthusiastic about the platform. In fact, he had received SMS via mHero during the last health worker census and for a payroll verification activity. Working with the mHero team in Liberia was motivating and informative. I saw how the fact that a team of ministry staff—who truly champion iHRIS and mHero—leading the implementation made it easier for other health sector staff to accept the platform and see its relevance. I also saw first-hand how important getting support from senior officials at the ministry was to moving the project forward. I look forward to continuing to learn from my colleagues and friends in Liberia as we scale iHRIS and pilot mHero in Sierra Leone. This is especially important because just one day after the World Health Organization declared the Ebola outbreak over in West Africa on January 14, Sierra Leone recorded its first Ebola death in more than 100 days. The potential for Ebola flare ups and other public health threats continue, so we must continue to implement mHero. But mHero is not only an essential communication platform for emergency management, providing a reliable, instantaneous communication channel for information and instructions during a crisis, it is also a vehicle for strengthening communication among health officials and health workers on a day-to-day basis, regardless of topic or urgency. 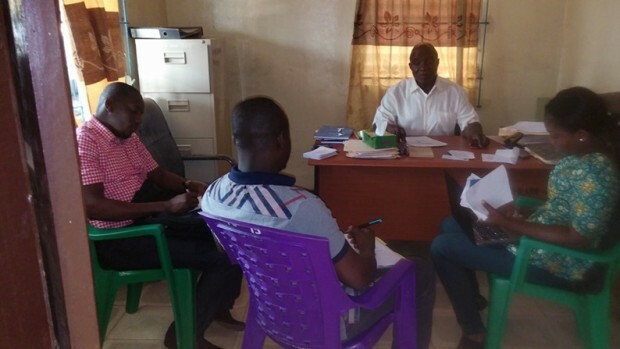 Photograph of the author and the Liberian mHero team members meeting with a county health official courtesy of Stephen Gbanyan. The author (left) with Hellen Greene, mHero Data Manager, in Liberia. Photograph courtesy of Stephen Gbanyan. The author (right) with Stephen Gbanyan, the Liberian Ministry of Health and Social Welfare's Director of Health Management Information Systems. Photograph courtesy of Stephen Gbanyan.